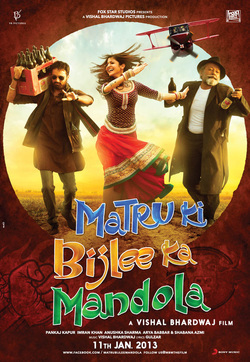 Set in the rustic surroundings of a village in Haryana, Matru ki Bijlee ka Mandola is a comedy-drama about Harry Mandola (Pankaj Kapur), a wealthy industrialist who loves his drink, his daughter Bijlee (Anushka Sharma) and the unusual bond they both share with Harry’s man friday, Matru (Imran Khan). UM: Tell us about your look in the film. Imran Khan: My character is very interesting. I play a global villager from Haryana, but someone who has travelled the world and speaks English. He is also well-read and has completed his LLB from Delhi. And since I have never been close to a village boy, it wasn’t easy for me to master the Haryanvi accent. In fact, that was my biggest challenge. I had to learn the dialect and also work on the body language and even turned into a tattoo artist. To get into the character for Matru Ki Bijlee Ka Mandola, I had to pierce my ears and wear gold studs. But in a few days, I was undergoing tremendous pain as it was infected. Unfortunately, I couldn’t wear those studs and I had to wear clip-ons. UM: Did you spend a lot of time in Haryana? Imran Khan: Vishal Bhardwaj couldn’t find the exact location so no I couldn’t spend time there. He wanted to shoot the film in Haryana, so we actually shot it in Gujarat. There is a part in Gujarat, which has the same feel as Haryana. UM: How was the camaraderie with Anushka? Imran Khan: When you are working with someone for over four months, you tend to get close. We had some real fun moments during the shoot. Anushka is a no-hassle, no-drama queen. She doesn’t come with a tag ‘I-know-Acting’ with a capital A written on her forehead. She’s non-fussy and uncomplicated and fun to be with. For me, a good co-actor is someone who gives you something to play off against. That way, I think we both had very good energy between us. I’ve worked with actors who ‘act’ with a capital ‘A’; actors who need two minutes of complete silence on the sets to act. Unlike them, Anushka is someone who doesn’t take herself very seriously. She’ll cry in the scene and then get back to discussing a joke after the take. UM: We heard that you gave her tips on how to deal with your uncle Aamir Khan? Imran Khan: Anushka has signed a film with Aamir, but I was just pulling her leg that I could teach her the ropes on acting with him. It was just a random joke and I haven’t promised to teach her anything. But, it’s fun to tell her that I know what Aamir wants best. UM: The rumor is that you were the third option for the role of Matru, after Ajay Devgn and Shahid Kapur...What are your thoughts on this and were you surprised that he picked you in the end? Imran Khan: I was not the third but the second actor to be offered the role. And I myself was surprised that he chose me. In fact, I even asked him if he wanted me for this film. I had no knowledge of the language; the character was completely alien to what I had done before. That’s when he explained to me that casting against type was what was exciting. The role sounded exciting to me but once I took it up, I realized that delivering the role would be one uphill task, in terms of the body language I had to use, the language. I had to create a three dimensional character of Matru. Playing the role gave me consistently sleepless nights because I didn’t know if I was doing it right. I remember constantly thinking through the shoot that I had made a huge mistake taking this role up. UM: Were you skeptical about taking up such a difficult role for the first time? Imran Khan: I was skeptical. I had great doubts about whether I will be able to learn the body language correctly. I was very nervous and I spoke to Vishal about it. He said, ‘I have immense faith in you’. He said, ‘if you can put your best effort, then you can do it.’ He introduced to me a teacher named NK Sharma in Delhi. He has a theater group there. I spent two to three months in Delhi working with him to understand the dialogues and the body language. Everything had to be learnt from scratch. UM: Who is your biggest critic? Imran Khan: The biggest critics in my life are my mom and my wife Avantika. The truth is that when you become an actor, when you become a celebrity, people will come and tell you ‘Bro, you are the best, you have done a good job’. So those people are everywhere, what is very rare is people who will say these are your weaknesses, this is your problem and this is where you have to work on. People who will honestly do that, those are very rare. UM: What was the experience of working with Vishal Bhardwaj like? Imran Khan: When such an established director approaches you it always feels good. Vishal is one of the finest directors working today. When he approached me, it was a great honour. He has his own standards. I always question myself whether I will be able to live up to that standard. As a creative person he is someone who works very, very hard. At the same time, he gives a lot of freedom to other creative people who are working with him. Be it a set designer, cinematographer or actors like me, he always gives you a lot of freedom. It’s like, I trust you, do something good. I am very happy with the way the film has shaped out. I had an incredible time working with Vishal. This is the first time I am working with such a seasoned and experienced director and now I understand how he makes such good films. UM: How do you benefit as an actor when you work with a director like Vishal Bhardwaj? Imran Khan: I never realized it before, but now I know that you get tremendous benefit as an actor. Earlier, I have worked with first-time directors or second-time directors… there is a sense of two of us finding our way together. We used to find the correct way of working. Here I am working with someone who has consistently proved himself and he knows what the correct way of working is. UM: Now that the film is releasing on January 11, are you nervous? Imran Khan: I think that in my experience, any person, who is an honest artist or worker, will always be nervous about whether they have done a good job or not. The greatest people that I know or respect would say, ‘Did I do good enough and can I do better?